Some years back I was exposed to the music of the Garifuna people on the Atlantic coast of Central America. It was one of those "wow!" moments, finding an amazing new sound, and a compelling history, in an unexpected place. Now I eagerly nab any Garifuna music I can find. It's that different from other music in Central America, and it's a great, unique sound. Swim east a bit, and there's Cuba. You know Cuban music, right? There's son and salsa and trova, Afro-Cuban jazz, and assorted related styles. Now the Creole Choir of Cuba adds a category I didn't know existed on the island nation. On their new album Tande-La (which translates as "listen! "), their vocal songs evoke a bit of South African Zulu polyphony on the opening track "Edem Chante" -- then there's the nearly operatic (or musical theatric) sound, as on "Maroule." All mixed with plenty of Caribbean-sounding call-and response. Where did this unusual music come from? I'm told it emerged with migrant Haitian workers, who blended musical styles as well as languages (they sing in Spanish, French, and Creole). The Creole Choir of Cuba is touring the USA in September and November. 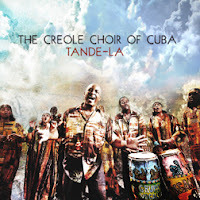 When I saw the Creole Choir of Cuba in your monthly list, I was already eagerly waiting for your review of them. They're indeed very good, some interesting harmonies. I definitely like Afro-Latin music! Probably related to this, the big news in North-East Brazil is that Lirinha, the singer of Cordel do Fogo Encantado has made his first solo CD available for free download on his homepage (here). Produced by Pupilo, drummer of Nação Zumbi. I positively urge you to check it out! Thanks for the heads-up on Lirinha -- I'm not familiar with his music, and will definitely nab that download and give a listen. great voices..i simple adore them.